Trump's latest budget includes a family leave proposal that would give new parents paid time off. The initiative comes as politicians on both sides of the aisle are working to come up with legislation to provide more workers with access to these benefits. Right now, states and employers have taken the lead on implementing paid family leave. Yet Americans worry about one thing when it comes to broadening these benefits: how much it will cost them. U.S. President Donald Trump chairs a Cabinet meeting at the White House in Washington, DC, in 2019. Paid family leave is still a priority for the administration of President Donald Trump. In his budget released on Monday, the President called for six weeks' paid leave for new parents, including adoptive parents, to recover from child birth and care for their children. But specific details on how such a plan would work are still up in the air. Trump has touted his family leave plan on multiple occasions before, notably his State of the Union addresses and past budgets. The proposal also calls for a $1 billion fund that would be used to help workers and employers create child-care programs. On Tuesday, Sens. Joni Ernst (R-Iowa) and Mike Lee (R-Utah) unveiled their own new proposal for paid leave that would give new parents anywhere from one to three months off, provided they delayed their Social Security benefits. Last month, Ivanka Trump, advisor to the president, met with Republican senators on Capitol Hill to discuss family leave. That meeting included Ernst and Lee, as well as Sen. Marco Rubio (R-Fla.), who previously put forward a similar proposal. Democrats, for their part, have put forward their own proposal with the FAMILY Act, which would give families 12 weeks off following the birth of a child or to take care of their own or a family member's health issues – something that is not addressed in the president's proposed plan. More than 24 states are already working on their own family leave policies, according to Vanessa Brown Calder, policy analyst at the Cato Institute, a Washington, D.C., think tank. "That seems to be already playing out with or without the White House getting involved," Calder said. The U.S. is one of the few developed countries without a national paid family leave program, according to the Heritage Foundation, a conservative Washington, D.C.-based think tank. 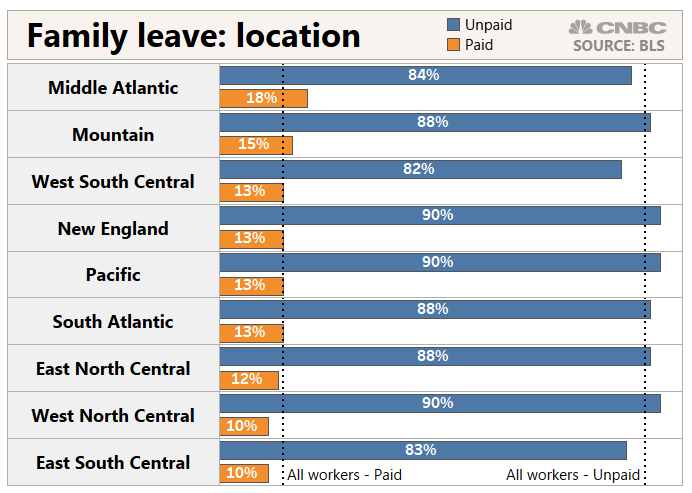 Instead, U.S. workers rely mostly on state-based and private paid leave programs. That leaves many Americans in the lurch, according to the most recent data from the Bureau of Labor Statistics. 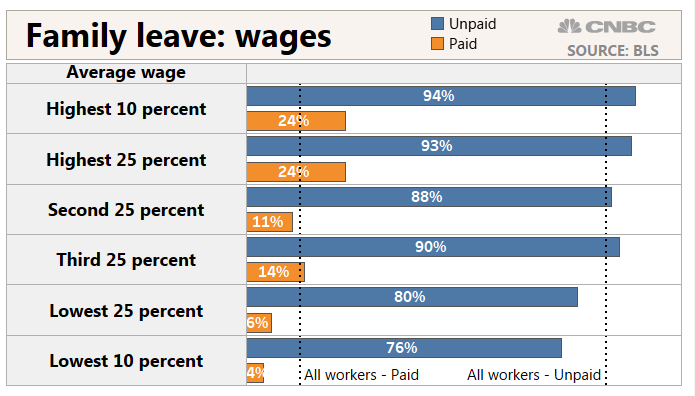 Of all workers who take family leave, just 13 percent take paid leave, while 87 percent take unpaid leave. Accessibility of these benefits also varies depending on a worker's wages, location and industry, the data show. A big concern with creating a federal program is how it might affect employers who are already providing these kinds of benefits, said Rachel Greszler, research fellow at the Heritage Foundation. "A lot of employers would interpret a federal program as providing coverage for family leave, and so they might not opt to start a new program that they otherwise would have, or they might opt to scale back or take back a program they already have," Greszler said. Currently, there are between $75 billion and $100 billion in paid family leave benefits provided in the private sector, according to Greszler. Yet those benefits mostly go to upper-income individuals. Ideally, a federal program would make these benefits more accessible to lower-income individuals without disrupting the private paid leave programs that already exist – and passing on the costs of those benefits to taxpayers, Greszler said. Americans are also concerned about who will pay for family leave programs, according to a December survey from Cato. Most Americans — 74 percent — support 12 weeks of federal paid family leave for new parents or individuals with medical conditions, the survey found. But that support drops falls once costs are mentioned. Cato's research shows that 54 percent of individuals support a federal paid leave program if it meant they would have to pay $200 more in taxes per year. That falls to 48 percent if they had to pay $450 more in taxes annually and dips to 43 percent if their tax bill increased by $1,200 per year. A large majority — 76 percent — do not want such a program if it means cutting funding to programs such as Social Security, Medicare or education.